I don’t like to take walks, much to the chagrin of my doctor, who tells me I should probably exercise, like, at all. Talk to my wife and she’ll tell you how pointless it is to try to get me to take a walk. Look, I like playing sports–golf and racquet sports and frisbee, because they have a point. There’s an objective there I can pursue. To walk for its own sake fills me with regret at all of the (seemingly) productive things I could be doing. Of course, I probably wouldn’t be doing anything productive anyway, but we all have our own self-delusions. All of that to say that I have no idea why I like Tokaido, a game about taking a walk, so much. Maybe I like it because it’s an impossibly pleasant walk, filled with beautiful picturesque landscapes and delicious meals. Maybe I like it because it does have a point–to accumulate the most points, of course, because this is a board game. Maybe I like it because I don’t have to get sweaty and dirty. A subtle critique of 21st century sloth or just a game? Just a game, but a fine one. Tokaido has all of the players travelling the famous Tokaido road between Kyoto and Edo (now Tokyo) and having a swell time. Each spot on the road will get you something–money from working on a farm, or maybe a piece of a panorama. Essentially this is a set collection game with a few different sets to collect. There are three panorama types that give you increasing numbers of points (1, 2, 3, etc). If you’re the first to finish any given one you get an additional 3 points. Money is used to buy souvenirs, which can give you loads of points if you stock up on them, because go consumerism? Hot springs just give you points–2 for a normal one, and 3 if there are monkeys, just like in real life. In some spaces you’ll find visitors who just give you random things, and occasionally you’ll stumble upon a temple, where you can donate money at a 1:1 money/point ratio, which is frankly bad, but at the end of the game you get loads of points if you’ve given the most money. So that becomes a passive aggressive game of one-upmanship, modeling religious politics perfectly. At the end of the game a couple of 3 point bonus prizes are given to people who accumulate the most of certain things, just for a bit of spice. The trick to Tokaido is that whoever is furthest behind on the path goes next, so skipping spaces on the road will reduce your total number of actions in the game. Thus, every single decision in the game is figuring out if the next available space is the best move. This manages to contextualize the decision space beautifully, making the game flow quickly and smoothly. That said, the game doesn’t have what I would call robust decisions at all. It’s a light game, and it provides the easy feeling of a stroll through the woods, but it’s not going to hurt your brain. The decisions are meaningful, for sure–a player who knows what they’re doing will certainly have the upper hand against a novice–but they’re breezy. There are usually a couple of good options. You pick one, and go on your merry way. Helping the game tremendously are the characters you inhabit as you play, which provide you with varying amounts of starting coin and a special power. These powers are significant enough to shape a general strategy, and they seem pretty well-balanced. They give you enough distinction from your opponent to gently nudge people into different approaches, which is great, because the board quickly gets very tight when multiple people are trying to accomplish the same tasks. This gives the decisions a bit of tension to them, as you need to try to predict what your opponents may try to go for in the short term, figuring out which spaces they might leave unblocked. 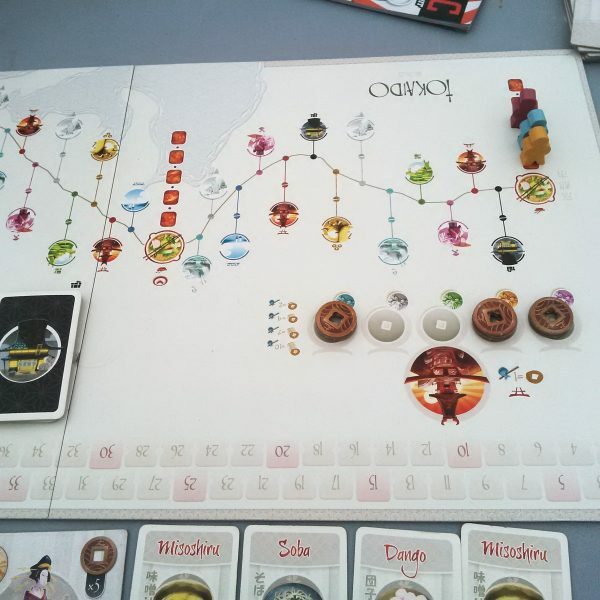 Because they all will also be choosing, realistically, between only a couple of spaces, this kind of deeper analysis doesn’t take too much time or effort; even more competitive Tokaido moves along quickly. Again, remember the context here. This is a light, family-weight game, and it’s not going to attract the uber-competitive types or those who feast only on the rich meats of heavy Euros. In fact, I can see it somewhat annoying people when they realize that the decisions they’re presented with are somewhat limited. For me, however, there’s just enough here to sustain my intellectual interest while the theme and setting of the game delight. 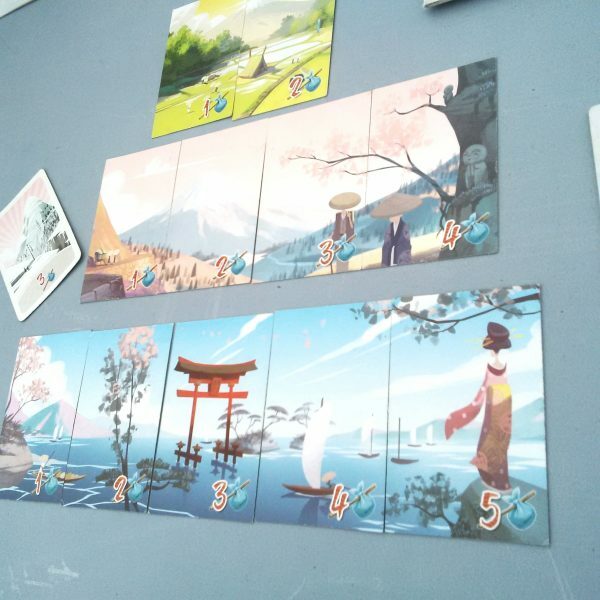 The art of Tokaido is beautiful, and I absolutely adore the white board (why don’t more games do this?). I love how the entire timeline of the game is contained on the board, so as you progress down the path, you get a very real sense of how far along into the game you are. I like the small cards you get as you accumulate possessions and experiences on your walk. The way the panorama cards group together to form an actual panorama once you’ve completed the set is beautiful. It also has a subtle way of drawing more of the theme into the play itself, as you want to get more parts of the panorama not only because they’re worth more points, but because you want to complete the image itself–mechanical point-gathering meets aesthetic completion. Also from a mechanical perspective, I like how the game subdivides the journey into four parts with a mandatory rest at an inn in-between. At the inn you get a random draw of meal cards, each worth 6 points, but costing different numbers of coins. The first person to arrive gets first choice, while the last person must take whatever the others didn’t buy (usually the most expensive). However, the last person into the inn is also the first person to leave, which means they get their choice of where to begin in the next segment. This adds jockeying for inn placement into the small list of considerations you must make as you progress–a neat touch. There is a potential problem, however, if the game does become competitive. As you’re blocking other players from spaces when you take your turn, the game can become a bit frustrating if it feels like everyone else is working against you. It’s passive-aggressive in that very particular Eurogame way, and occasionally it can feel like your walk has been spoiled by the movements of others, intended or not. I’ve found that there’s usually enough time in the game to pivot to a different path (pun intended) if you find your original goals hampered by competitors, but the frustrating feeling does play against the spirit of the game a bit. I’m not sure how this could have been remedied without removing all decisions from the game, and I’ve never been particularly frustrated (except in the 2-player variant which is significantly more passive aggressive than any player count), but I’ve seen it happen to others. If you’ve read my reviews before or have listened to the podcast, you know that I favor heavier, longer games. It’s hard for me to find light, quick, filler games that are satisfying, as I find many of them lack real decisions or any kind of tension. 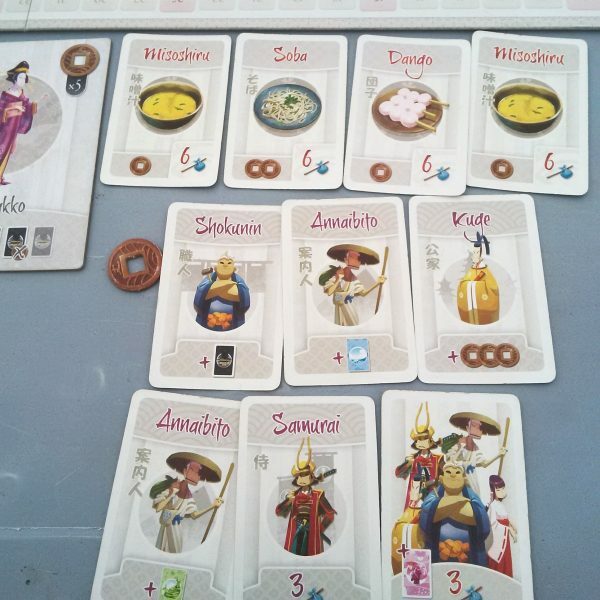 Tokaido manages to find the shortlist of lighter games that I really do enjoy. The combination of aesthetic pleasure from the art with interesting decisions and a deft, graceful feeling to the game make this a light game I frequently find myself wanting to play. It’s a graceful departure from the stress of the day, a way to clear the mind and just enjoy the ride. Something that real walks don’t provide. I have the Crossroads expansion and I’ve found it to be a great addition to the game. It provides players with a choice between two options at each of the locations on the board. This makes the game a bit more meaty and perhaps opens up more space for unusual strategies. The choices are good, although they do add a bit more randomness to the game–a couple of decks with random items in them and a die used at the “gambling house” where you can risk your money for the chance at riches. I enjoy both the original experience and the more involved Crossroads game. If you find yourself enjoying the idea of Tokaido but not its lightweight execution, you should certainly give Crossroads a look. At the very least you get some new characters! I adore this game, too. I’m a mid-weight Euro guy, usually, but this one is just a delight. This is a wonderful introduction to the hobby for “non-gamers”, as it provides fun play in a minimally competitive setting supported by great artwork. Matsuri is the latest expansion, which offers additional choices to the players (possibly adding to the potential for analysis paralysis, although I think Tokaido is still immune to that frustrating phenomenon). I will say the Collector’s Edition with its painted miniatures is also a work of (flawed) art, but the 2 1/2 year KS fulfillment slog was the exact opposite of the otherwise pleasant journey Tokaido can be.